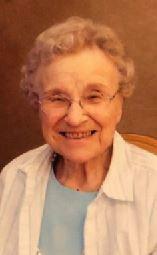 Johanna “Jo” Graves, age 97, of Holland, MI passed away on Dec. 2, 2018. Jo will be remembered by her family as a loving and devoted wife, mother, grandma, & great grandma who was the glue that kept the family connected. Jo was born in Pella, Iowa to Peter and Gertie Keuning on Feb. 13, 1921. She met her husband, Raymond Graves at Calvin College & they were married on June 7, 1950. Ray was ordained as a pastor in the Christian Reformed Church in 1952 and together they served seven churches in Iowa, Michigan and Minnesota. Every parsonage her family moved to she made into home. Along with her many church activities she enjoyed gardening, sewing, travel, camping, crossword puzzles and bowling. After retirement in 1988 they settled in Holland and enjoyed hosting family and friends at their home on Chippewa Ave. They were active members of Calvin CRC. In 2010 they moved to Sandy Cove and made many new friends. Jo continued to serve here ...playing piano, leading chair exercises and encouraging other residents to participate in community life! Jo is survived by her children, Carole (Doug) Pulscher of NE, Philip (Ruby) Graves of MN, Colleen (Dan) Oosting of MI, Jean (Rick) Groenhof of MI, Jan (Frank) Artigue of LA; 13 grandchildren; 30 great- grandchildren; and sister, Ruth Huyser. She is preceded in death by her husband, Ray in 2013 and also by 5 sisters and 1 brother. Funeral service will be held at Northwood Chapel-Dykstra Funeral Homes, 295 Douglas Ave. on Dec. 7 at 11:00 AM. Visitation will be from 6:00-8:00 PM., Thursday, Dec. 6, 2018 and 10:00-11:00 AM, Friday, Dec. 7 at Northwood Chapel-Dykstra Funeral Homes. Memorial contributions may be made to Hospice of Holland. The family wishes to extend their gratitude to American House (Beachside staff) and Hospice for the wonderful care given their Mom in her last days.